It&apos;s another strong year in Emmy nominations for television shows filmed in Westchester, with Orange is the New Black coming up big in the top categories, including outstanding drama series and best supporting actress. The Good Wife, The Americans, The Blacklist, and Boardwalk Empire are other top shows that snagged nominations, signaling the quality of film productions happening in Westchester County. "When popular shows like these are recognized, it spotlights Westchester County, where the film and television industry is alive and well—and growing bigger each year," says County Executive Rob Astorino. "We congratulate all of the talented professionals whose hard work led to the nominations and we are hoping for big Emmy wins in September." 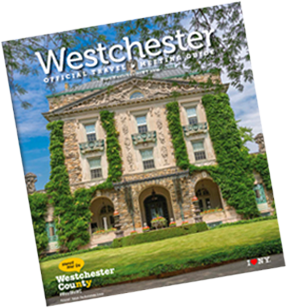 Westchester County attracts film and TV production because of its film-friendly climate and the diversity of location options, says Natasha Caputo, director of Westchester County Tourism & Film. "You&apos;ll find just about any backdrop required —from small town scenes and urban landscapes, to sweeping river views, historic mansions, a film-friendly airport, jail, and several hotels," she notes. "We work very closely with industry professionals to find just the right location to meet their needs. We&apos;re proud of the work they do here, which also has a positive economic impact on our local economy." In the image above, the location team transformed a Yonkers street into a turn of the century cityscape for The Knick (Cinemax), which earned several Emmy nominations including best directing, hairstyling, and makeup. 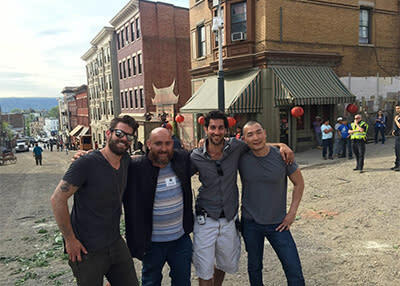 Left to right: Jordan Bowes, Location Manager Rob Striem, Christopher Wos, and Hyo Park. The 67th annual Primetime Emmy Awards will air Sunday, Sept. 20, at the Microsoft Theater in Los Angeles, hosted by Andy Samberg and broadcast live on Fox.